Featuring a solid, all-welded steel frame and anti-skid mat, the Tuff Truck handles heavy loads with ease. Solid rubber casters provide smooth maneuverability on any surface and its handle folds down for easy storage. Some assembly required. 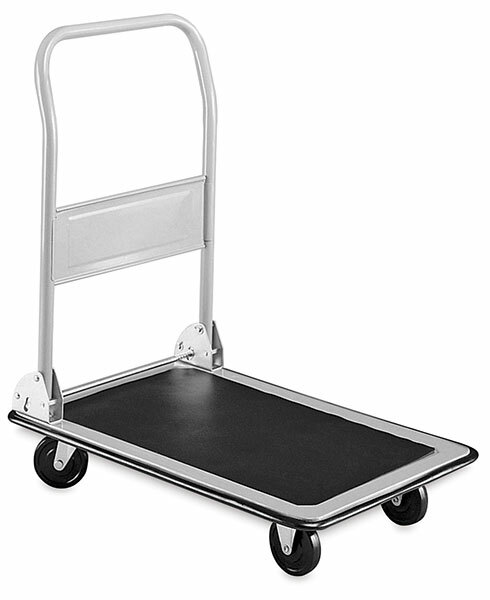 This truck features a 19"W × 29"D (48 cm × 74 cm) platform and a 400 lb (181.4 kg) load capacity. Weighs 22 lbs (10 kg). ® Safco is a registered trademark. ™ Tuff Truck is a trademark. ® Greenguard is a registered trademark.